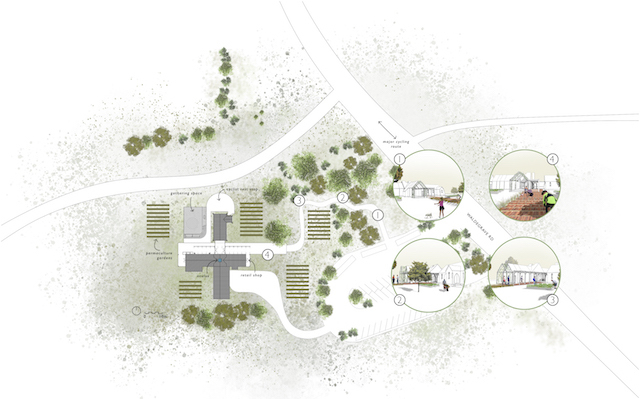 At the cross roads of cycle paths, gold mines and the local food bowl this adaptation of a derelict church seeks to embrace community with a diverse multi function gathering space. A humble one room church is to be extended to serve a diverse local community of farmers, miners, families and cyclists. A kitchen produces take-home meals for local families and miners; cyclists are serviced by a café; and two flexible dining halls accommodate groups for formal gatherings or business meetings. Open air concerts are set in an outdoor amphitheatre which also acts as a marketplace and extends the seating area of the café and restaurant. 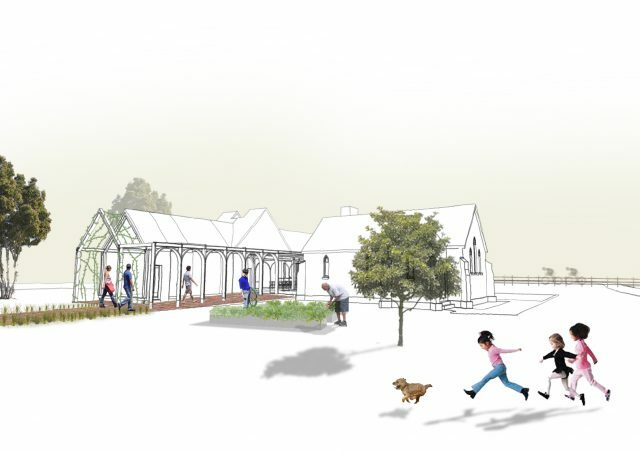 The Pilgrimage at Spring Terrace is intended to support local growers by utilising local produce in the restaurant and market place; the restaurant, café and shop provide jobs to people in the area; and an outdoor amphitheatre extends the opportunity for celebration, gatherings and recreation. The intersection of circulation and form is a place for reflection, gathering and light. 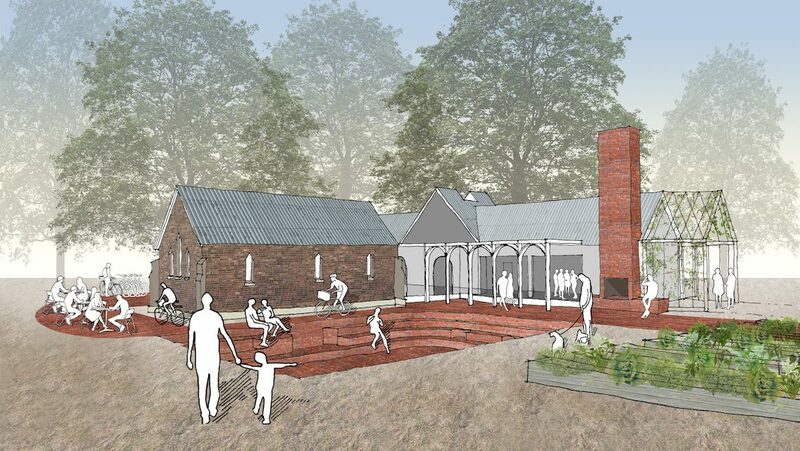 Hardwearing, low-maintenance, raw materials are used as a reflection of the church and farming vernacular: including brick, galvanised metal, and timber. The plan of the existing church is extended to reflect the symbol of the traditional gothic church. 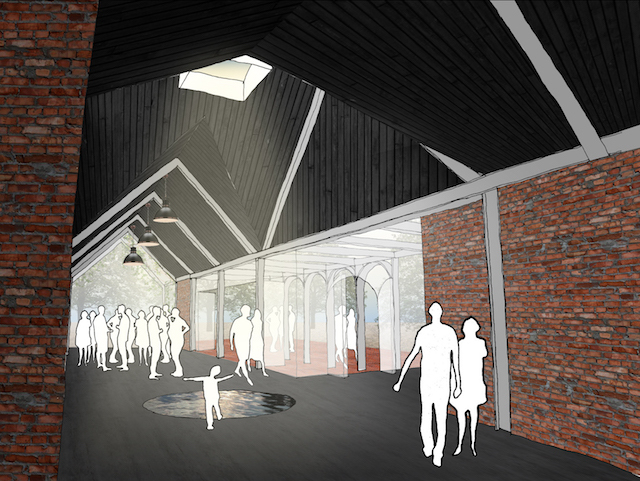 The existing church is to be retained and complemented with a new dining hall to the west. The entrance axis is extended east-west to become the place of arrival, extending through to connect to the western dining hall and amphitheatre; while the east end is to accommodate retail. 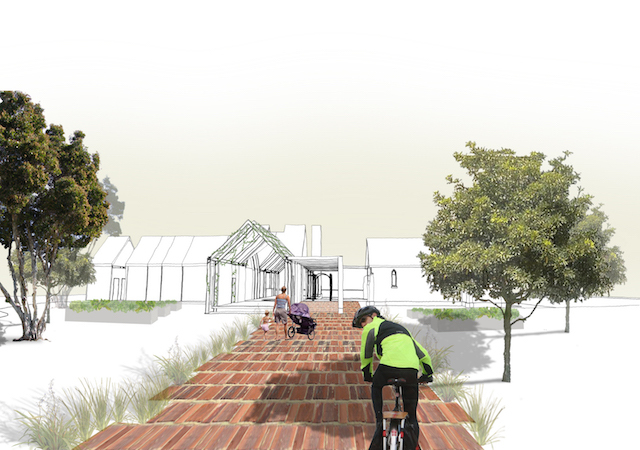 A new kitchen and services, are housed in the southern extension, and a terrace to the north of the existing church provides a sunny place for cyclists to experience their daily ritual: coffee. The existing church form is simply extruded and extended south and expanded east-west, to accommodate the proposed programs. 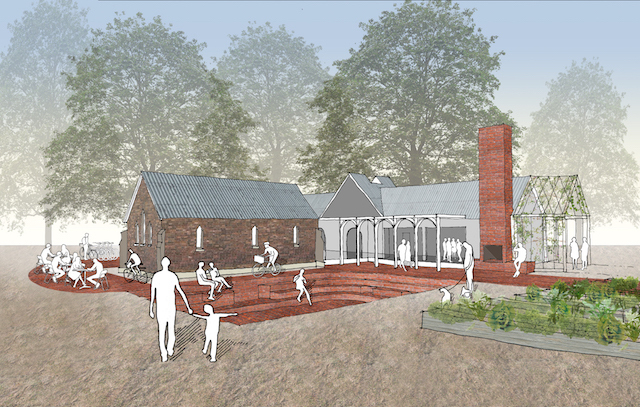 A lightweight steel structure reflects the form of the existing masonry church. The intersection of circulation and form is pulled back from the existing church to bring sunlight into a central pool: a place for reflection, gathering and light.